Even though Bratislava is a completely landlocked city, there are plenty of places with a real seaside atmosphere. The Danube River’s banks, just a few steps from the city centre, transform every year into sandy beaches with bars and beach volleyball courts. 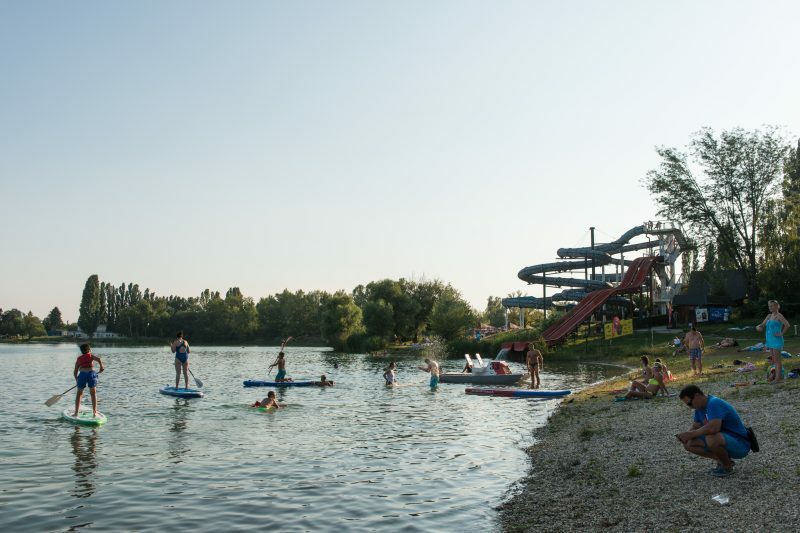 On the outskirts of Bratislava, the Zlaté Piesky summer resort offers everything from bathing to adrenaline water sports. You can also cool down in traditional open-air summer swimming pool while the Divoká Voda white-water resort in Čunovo is the perfect place for rafting lovers. Just take tram Nr. 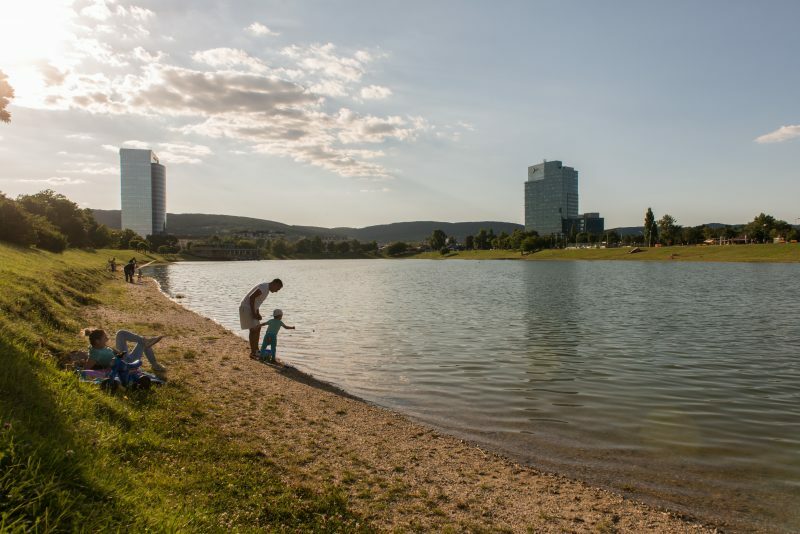 4 and you’ll soon be in a completely different world: the summer resort with the largest lake in Bratislava – Zlaté Piesky or Golden Sands in English. This summer resort has everything you need for a spectacular summer holiday: a gravel beach, refreshing water, beach umbrellas, shade under the trees, sports courses and children’s playgrounds, as well as water bikes and a toboggan. If you want to be more active, go to the Wakelake area with the wakeboard cable tow right next to the beach. Professionals and beginners alike train here on various ramps and barriers. The dynamic music playing in the background will get your blood moving even before you try wakeboarding, which combines snowboarding with surfing techniques. Ondrej Konečný used to watch riders perform unbelievable acrobatic stunts. Only later did he dare to get on the wakeboard. “I’ve also tried riding a flyboard. This is a flying board powered by waterjets, on which you can fly over water. I felt like Superman,” laughs Ondrej. More adrenaline-packed fun awaits on the opposite end of Bratislava at Divoká Voda. Hop on a raft with your friends and travel down the man-made wild river or have a good romp on the only artificial surf wave of its kind in Europe. With the Bratislava CARD City & Region tourist card you receive up to a 54 percent discount here. Entrance to Zlaté Piesky and other open-air summer pools in the city, such as Tehelné Pole and Delfín, cost less with the card. If you want to discover a place off the tourist track, you will surely enjoy the cosy atmosphere of the Mičurin open-air pool in the residential area near the Bratislava Castle. Families with children will appreciate the Rosnička open-air pool with a 50-meter long three-course slide. Complete your enjoyable day at the Kuchajda lake, close to the Polus shopping centre. Take a yoga or Latino fitness class or catch fish for a fresh dinner. An evening screening of a movie in the open-air cinema is the perfect end to an unforgettable day. You can also spend the hot summer days on modern city beaches along the Danube. The most famous is the Magio beach on the Tyršovo embankment. Snow-white sand converts this part of Bratislava into a seaside resort every year. Katarína Selecká is a regular visitor and loves to bring friends here. Everyone appreciates the pleasant environment with views of the Danube and the Old Town. “You just sit here in peace,” she says while lounging in a beach bed with lemon ice cream in her hand. Magio Beach offers something for everyone. Visitors can read books, take fitness lessons, play beach volleyball, sip on an exotic drink and taste some ice cream at the evening concert, or watch a movie in the open-air cinema. You can also enjoy the seaside atmosphere at UFO beach, close to the SNP Bridge and on the newly-opened city beach close to the Old Bridge on the opposite riverbank.